Leaving a legacy is not very complicated but you should use a solicitor to write or update your will. It’s not expensive and can be a great relief to know it’s done and out of the way. Don’t put it off. We would recommend that everybody has a will. It’s also a very personal way to remember your favourite causes once you’ve ensured that all of your loved ones are taken care of. Leaving a gift in your Will of any size will help us change the future for the world’s most vulnerable children. It can be daunting thinking about making a Will but it needn’t be. We have a free guide and form that you can complete and take to your solicitor. This will help you prepare and think about what you want to happen, it also explains the process and legal terms to make it easier for you. 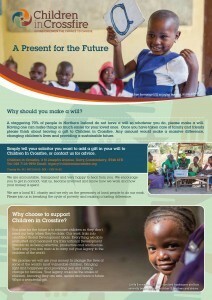 Please think about leaving a gift to Children in Crossfire in your Will. Your legacy will be the smiles of our children in Tanzania and Ethiopia. Children that will be fed, have clean water and be educated. Children that will be able to fulfil their full potential in the world because of your thoughtfulness and generosity. A wonderful way to be remembered. Call us on 02871 269898 or email legacy@childrenincrossfire.org for your free guide.